NOTE: The following describes a modification of your Palm, possibly voiding your warranty!!! A second note: After starting that page, I discovered Bens Pilot Page (UPDATE: I can't find his page anymore). He described the same idea. What I don't like, is his way to contact the free pin. I believe, solder on the golden pads is a problem. I was searching for another solution and I think I found one. I also wanted to provide a bit more information on a safe way to supply the Palm and charging the batteries. WARNING: The Palm IIIc cradle (color Palm) uses the same pin than the following modification to supply power to the inbuilt charger of the Palm IIIc. NEVER put a Palm that was modified according to the instructions below in a Palm IIIc cradle that's connected with its original Palm IIIc power supply. That wall brick is NO charger, it's just a power supply that would ruin your NiMHs with it's 1Amp output current!!! UPDATE: I finally changed the numbering of the pins to the 'official' standard. To make it clear once again: The pins on the cradle are numbered 1-10 from left to right looking at the cradle as it stands on your desk. Looking at your face down Palm with the connector pointing towards you, the numbers run of course 1-10 from right to left then. When you read my page 'Power for the Palm', you've probably noticed that I'm a fan of rechargeables. I don't want to say that 3COM/USR missed something, when they left out the possibility of an external power supply. After all the Palm's a real low power device and I guess most people can live quite good with batteries. But for rechargeables it would just be nice, if they could be charged remaining in the Palm. BTW, the dot 7 command proves, that Palm did at least think about rechargeables. The craddle on the other hand is the perfect charging station (I'd wish my mobil phone charger would provide such a nice physical support ...). So my first thought, after I started using NiMHs, was how to modify the system. Fortunately there's one pin at the serial connector, that's not in use. It's the only pin that has no visible lead into the Palm, I name it pin 9, left of it (assuming your unit is lying face down, the connector pointing towards you) is pin 10 which is ground. You need to make a connection between this pin 9 and the positive batterie terminal. Soldering on the golden pad is no good idea, cause with the proper temperature the solder will flow over the golden surface and spoil the pad. I took 'silver conductive paint' instead, to contact only the very top. I don't know where to buy that paint in the States, but stores for model-making or electronic suppliers are good addresses. Don't get me wrong, it's not any silver colored paint, that wouldn't work. It's a special, fast vaporizing fluid with disolved silver in it. After applying, it dries quickly and only a thin silver layer remains, that's an excellent conductor (BTW, years ago I repaired the heatable rear-window of my car with it. There was a little crack in that heatable serpentine lead and you can't solder it. I just painted a bit of that silver stuff over it and it works since then. Saved me alot of $$$). Make sure the edges are firmly pressed onto the board, so the paint can't reach under the tape. Then apply the paint *carefully* from the top of the serial pad to the wire. Take special care not to short the wire to the ground ferrit (J4). Wait a few minutes (or until the paint is dry) and remove the tape. You should now have a perfect connection from pad 9 to the resistor. From there, just run another short wire to the positive batterie terminal. When you did everything right, you should be able to measure the battery voltage between pin 10 (ground) and pin 9. That's it for the Palm. The modification of the new Palm III is even easier, since 3Com was kind enough to connect an empty lead to the unused pad. So please read the section of 'How to modify the old Palms' and then forget all about the messy part with the silver paint :). Instead look at the image below and locate lead on your board. Right below the yellow arrow on the image, the lead disappears to the other side of the board and there it ends with a little golden test pad. 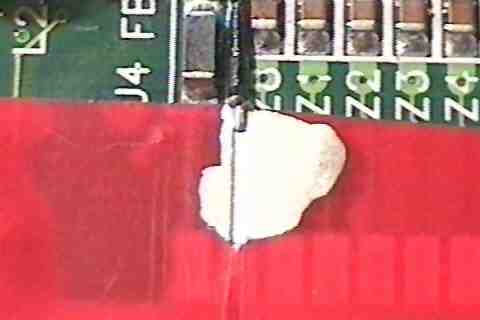 But unfortunately we can't use that to solder a wire, since it is the area where the key contact rubber is located. And that should lie absolutely flat - so *no solder* on that side! Instead, scratch off the solder stop mask at the marked position. 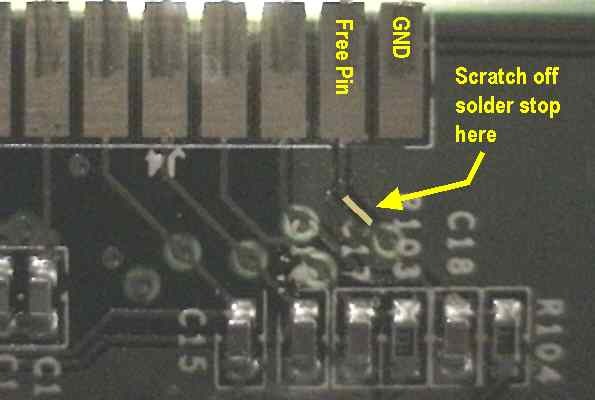 Take care that you don't scratch off the solder stop from the GND-layer left and right of the lead. It helps to prevent shorts, later when you have to solder your wire! The rest is easy. Solder a little wire, possibly parallel on the scratched spot. It's up to you, whether you want to add the 10 Ohm resistor or not. You could also solder the wire directly to the battery lead, but be aware, that an accidently short between pin 10 and 9 for example will vaporize the little piece of lead between your wire and pin 9, not to talk about other damages!! A 10 Ohm resistor won't harm and it'll limit the current to a non-dangerous value. I fixed the SMD resistor (size 1206) with a *tiny* drop of hot glue - it isolated and is removable. Finally solder the wire - either from the resistor or directly - to the positive battery terminal. 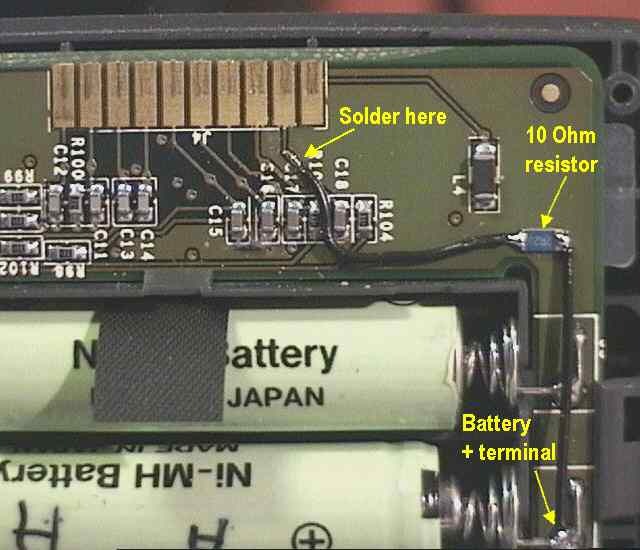 It's a good idea to run the wire in about a 5mm (1/5 inch) distance along the battery compartment (like on the image). Look where the case back presses on the board when the case is closed, then you know why. For this reason, you also have to do an additional, little case modification. Below you see an image of the case back. 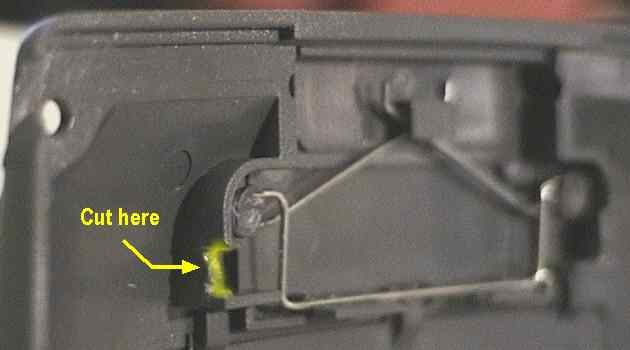 The housing of the RS-232 cover spring presses directly on the board when the case is closed. So the wire would be squeezed and/or the case wouldn't close properly. Just take a sharp knife or a cutter and cut a little notch where it's marked on the image. When closing the case, try to take care that the wire is running through that notch. Done! Well, there's not much to say about the modification of the cradle. The hardest part is to 'open' the bottom part of the craddle where the wiring is hidden. I think the easiest way is just to 'slide' the little front cover downwards, parallel to that 45 degree angle the cradle has. You can take a little pliers and squeeze that plastic pegs that are located at the bottom of the cradle, left and right where the cable runs in, while you simultanious try to slide the cover off. Sorry, it's the best explanation I can give. Basically I found several posibilities to add the needed supply wire. The first and easiest of course is, an additional, seperate wire. Then you either fix that wire with several pieces of tape along the existing hot-sync cable or you have always that wire in your way. I don't like that. The second solution is already much better. Additionally to the 6 wires yellow, brown, blue, black, green and red that are in use, there are 3 more wires, white, gray and purple, running in the hot-sync cable. They are cut off with the outer isolation, but they can lengthen again with a piece of wire. Unfortunately they have no connection in the 9-pin SUB-D connector, but you can open the outer isolation carefully close to connector and reach them there. In any case, using these free wires saves you the clumsy extra wire running over your desktop. You can choose your preferred solution. In the end you need two wires for the charger: a negative from pin 10 of the craddle and a positive from pin 9. Actually the modification of the new cradle is the same than for the old one, but easier. First thing is, the new cradle opens much easier. When you take out the one screw at the bottom, the cradle falls basically apart. Then, there is no nasty hot glue over the pins we need. Instead, there is a nice, free solder pad. So just add your two wires to pin 10 and 9 and close the cradle again, that's it! If you can get a hold of a Palm IIIc cradle, you have the perfect cradle to use with a modified Palm III. 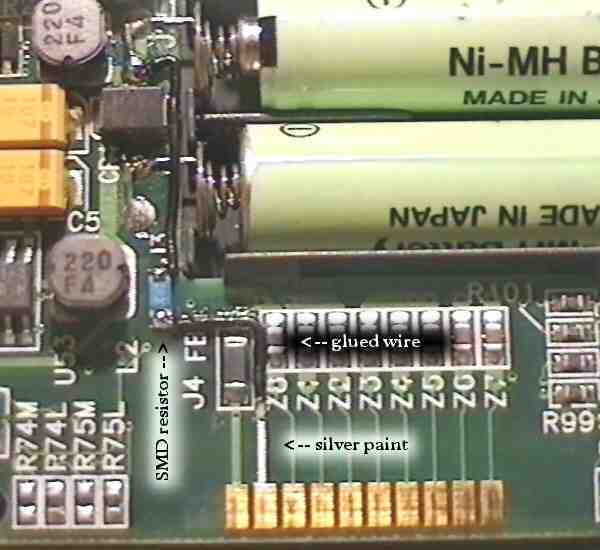 On that cradle, pin 9 is already connected to the middle contact of the DC plug in the serial connector, GND is the outside ring of the DC plug. So all you have to do, is to connect your charger (NOT THE ORIGINAL PALM IIIc POWER SUPPLY!!) to that DC plug - done. To make a long story short, I don't have a solution yet. In the moment I'm using a left-over prototype of a very expensive charger I developed for an AV company for their camera batteries. All parameters can be set independently on that device. But I agree, that would be a bit of an overkill ... I'm thinking about a simple solution and I'll post the schematics here, when I found one. 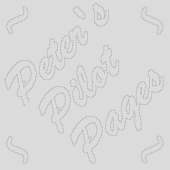 Copyright © 1997-2000 by Peter Strobel, all rights reserved.